Nearly 1 in 5 people with HIV don't know they are infected, don't get HIV medical care, and can pass the virus on to others without knowing it. Too many people don't know they have HIV (human immunodeficiency virus). About 1.2 million people are living with HIV in the US but about 240,000 don't know they are infected. Each year, about 50,000 people get infected with HIV in the US. Getting an HIV test is the first step to finding out if you have HIV and getting medical care. Without medical care, HIV leads to AIDS (acquired immunodeficiency syndrome) and early death. There's new hope today for stopping HIV in the US. Medicines (antiretroviral therapy or ART) can lower the level of virus in the body. ART helps people with HIV live longer, healthier lives and also lowers the chances of passing HIV on to others. However, only 28% are getting the care they need to manage the disease and keep the virus under control. To help stop HIV, get tested. If you have HIV, get medical care and work with your health care provider to control the virus and not pass it on to others. 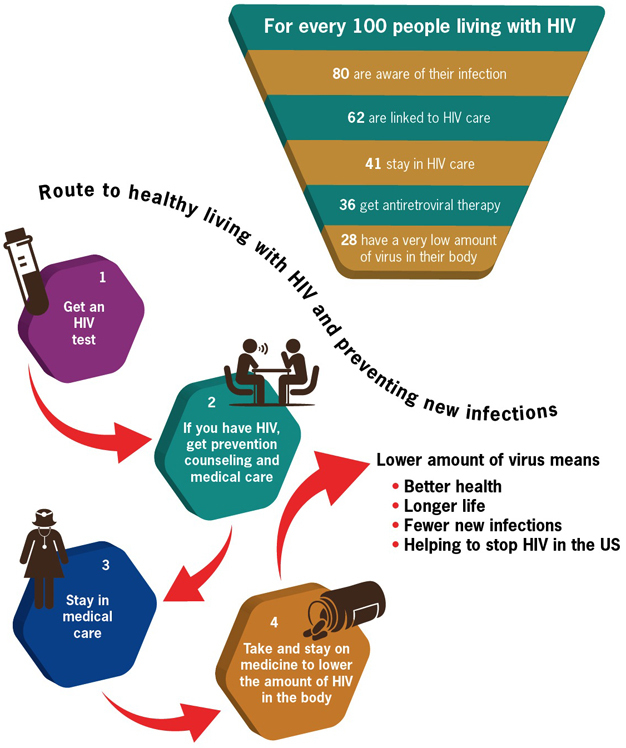 Learn what you can do to prevent HIV through testing and medical care. Many people don't know they have HIV or take all the actions to control it. Nearly 1 in 5 people (about 240,000) don't know they are infected. People who don't know they have HIV have a higher risk of serious medical problems and early death. People who don't know they have HIV can also pass the virus on to others without knowing it. Provide information about where people can get an HIV test such as www.hivtest.org .